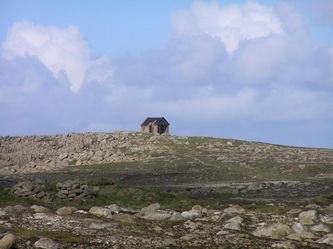 Tory Island is a tiny island just 4km/2 and a half miles long and 1.2km/three quarters of a mile wide sitting the Atlantic Ocean 11km/7 miles off the north coast of County Donegal. 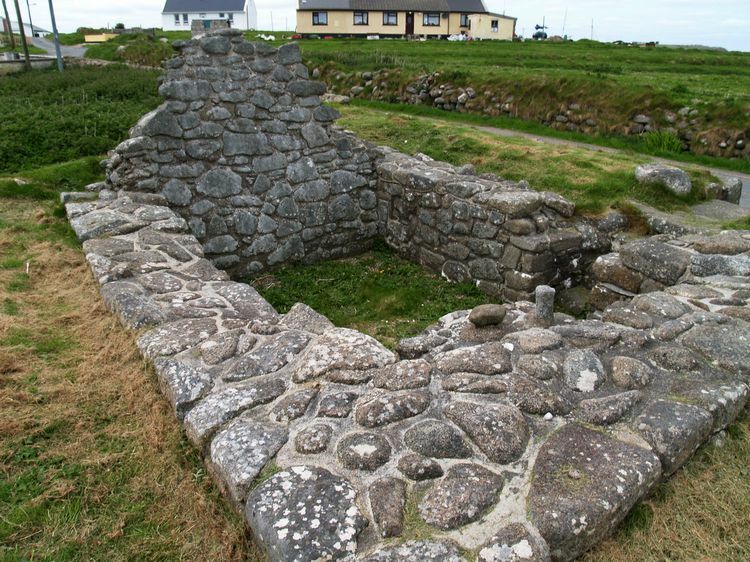 It can be reached by one of two ferries which run on a daily basis (weather permitting) from either Magheroarty or Bunbeg. The ferry journey takes about 40 minutes and is for foot passengers only as you can't bring a car to the island (you won't need it anyway as there is only one road). A helicopter also visits the island once every two weeks bringing a doctor from the mainland to the island health centre and spare seats can be sold to visitors seeking a visit to Tory. But although a quick visit is possible, we would recommend a minimum two night stay to try to see and experience all that Tory has to offer. 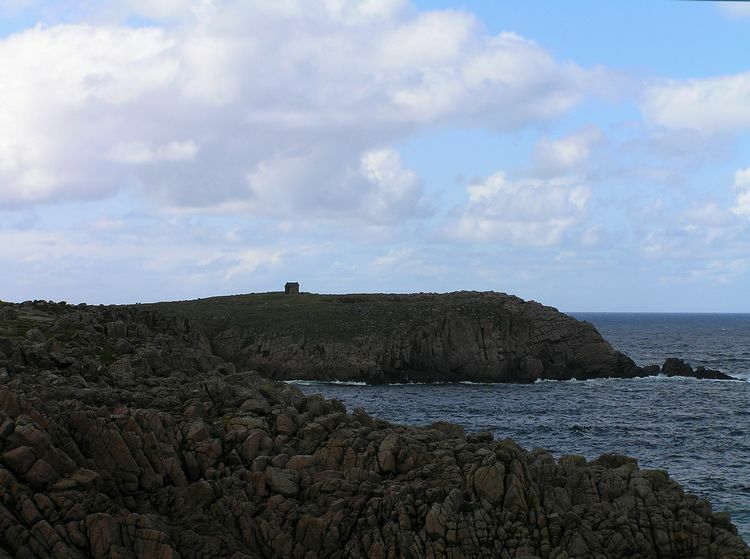 The island gets its name either from the Irish for rock ~ tor, or perhaps for the Irish for robber (pirate) ~ torai. 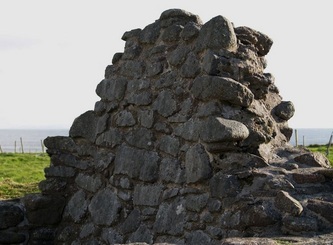 The first meaning refers to the cliffs and rocks that surround Tory and the second version refers to the first inhabitants of Tory, and indeed all of Ireland, the Fomorians, a sea faring band of pirates said to be decendents of Noah. Their king was Balor who was known as Balor of the Evil Eye or Balor of the Mighty Blows. 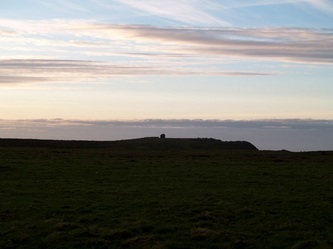 At the far east coast of the island lies the ruins known as Balor's Fort. 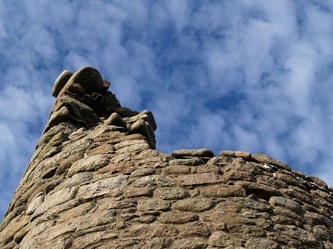 Tory is an island of great beauty, rich in history and mythology and a place that time has almost forgotten. For anyone wanting to see a little piece of Heaven and experience a more easy going and gentle way of life, even for a short period, Tory is the place to go. 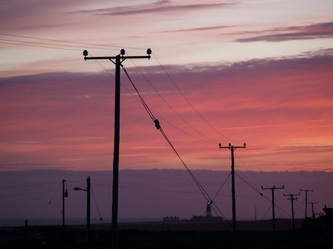 Of course there are most of the usual modern day 'needs' there: internet service; phones; TVs and the like, but it still retains a special aura of bygone times. 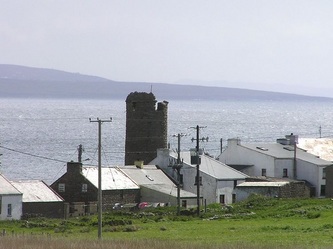 The people of the island are friendly and welcoming and although their native tongue is Gaelic, they are perfectly happy to converse in English to those who can't speak Irish. There are people of great talent there ~ artists, musicians, dancers and they are all willing to share with visitors their rich heritage. They know too how to enjoy life as anyone who has ever attended a celie there will verify. The music, dancing and craic can last until daybreak and everyone joins in, even the visitors. 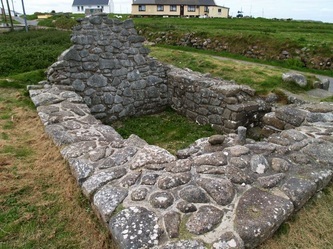 It's a great place to go to learn about Irish culture and ways , indeed many people travel to Tory particularly to improve their Gaelic (Irish). The views on and from Tory are amazing ~ just gazing over the cliffs into the churning Atlantic crashing off the jagged rock formations many feet below is truly breathtaking. 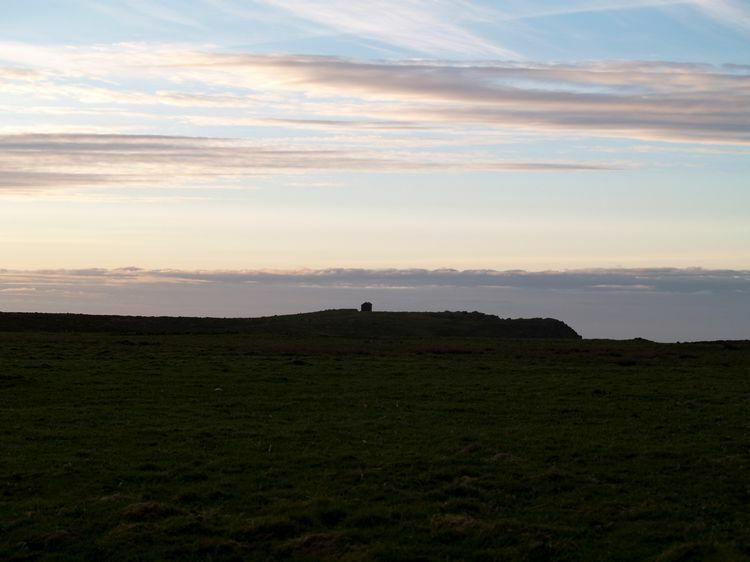 Walk along Tory's only road with views of stunning almost moonscapre grainte strewn land to the east of the iland leading to the cliff edges and then to the west of the island with it's distinctive lighthouse and the waves crashing onto the low shore front. 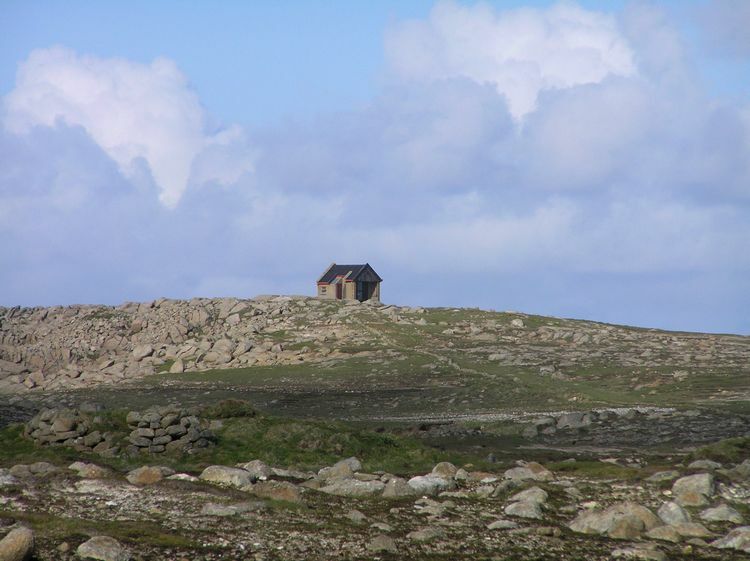 Artists, photographers and those who simply enjoy beautiful scenery will love this island. 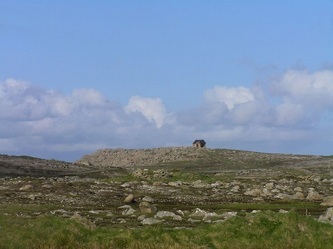 The island consists of cliffs on the north side, granite coastline which rises gradually to the pink quartzine high tors on the far north east of the island, the highest being Tor Mor which is approximately 35 meters/115 feet high (WARNING: These areas are dangerous during winds and the edges, being grassy, can be extremely slippy so great care must be taken when exploring this part of the island). 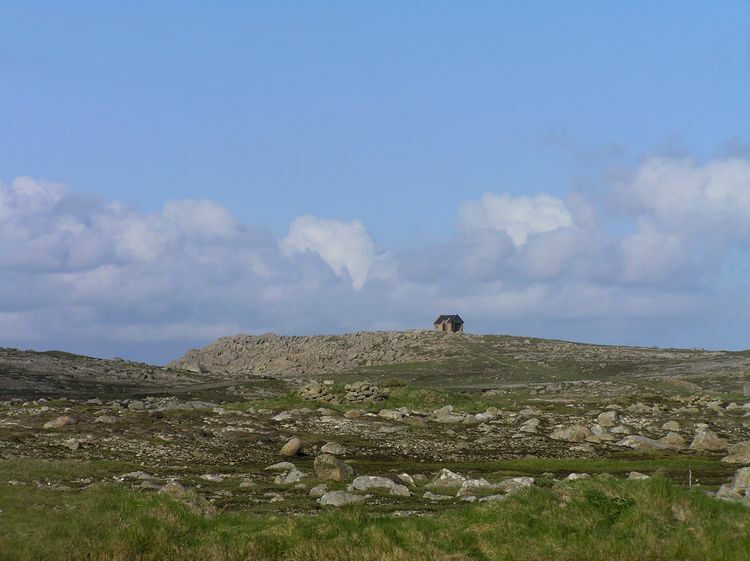 The south of the island is mainly rocky shoreline with with two small lakes, one of which is saline, Loch O'Dheas (south lake), which is one of the few natural lagoons in Ireland. The other lake at this end of the island is a fresh water lake, Loch O Thuaidh (north lake). An Loch O Thoir (east lake) is at the other end of the island. There are no rivers and very few trees - some say none at all but there are a few large bushes which may just about be called small trees. Tory does however boast a huge selection of plant life. 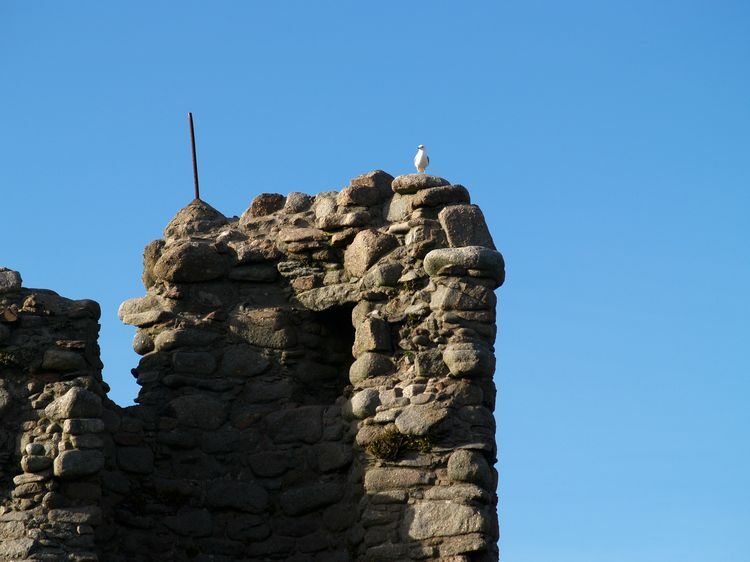 On the cliffs to the north of the island can be found Red Fescue, Scot's Lovage, Sea Mayweed, Sea Kale, Survygrass, and Thrift. Around the lakes plants such as Bog Pondweed, Bristle Club-rush, Bulbous Rush, Common Cottongrass, Common Spike-rush, Floating Club-rush, Marsh Pennywort, Sharp-flowered Rush and Water-purslane grow. Other plants found on Tory are Bell Heather, Common Birds Foot, Curled Dock, Fucus Spiralis, Heather, Heath-grass, Marsh Pennywort, Meadow Buttercup, Redshank, Sea Sandwort, Sea-milkwort, Speer-leaved Orach, Silverweed, Tormentil, Trefoil, Velvet Bent, Wild Angelica and Yorkshire Fog. Being the only inhabited Irish island to have been designated a Special Protection Area for birds by the E.U., the island has an abundant bird community,. The cliffs play host to a variety of species: fulmars, great black-backed gulls, guillemots, herring gulls, kittiwakes, Manx shearwaters, peregrin falcons, puffins, ravens, razorbills, shags, and storm petrels. 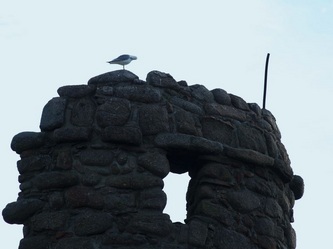 Other birds found on the island include arctic tern, chough, dunlin, Eider ducks, lapwing, little tern, oystercatcher, pheasant, redshank, ringed plover, snipe, tree sparrow, and wheatear. 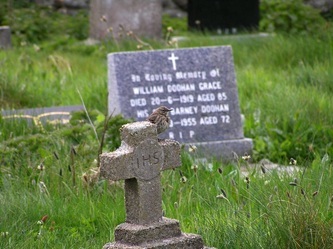 Added to these the corncrake population is increasing on the island as Tory offers it a safe place for nesting, there being no natural predators (foxes, rats, stoats, etc.) and little use of farm machinery. Some other rare species which have been noted on Tory include: arctic warbler, arctic redpoll, great grey shrike, olivacerous warbler, paddyfield warbler, rustic bunting and the yellow-breasted bunting. In the seas around Tory there can be found various species of both shark and whale together with grey seals and common seals. On the island itself can be found pigmy shrews, wood mice, and rabbits - indeed we spotted a number of wild black rabbits, they obviously being descendants of an escaped pet rabbit at some time. 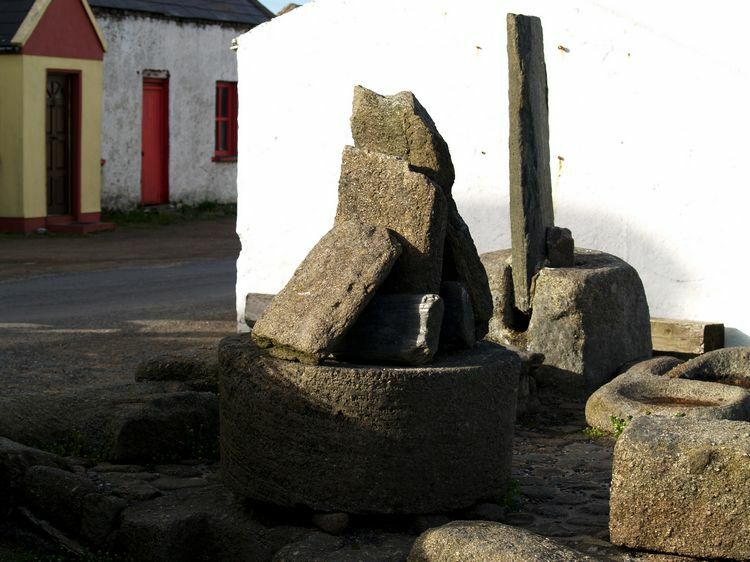 Tory is unique too in that it is the only remaining island of Ireland that still has it's own king, currently Patsaí Dan Mac Ruaidhrí (Patsy Dan Rodgers) and he makes every effort to greet the ferries arriving into Tory and welcome the visitors to the island. PLEASE NOTE: This page is still being worked on and there is much more to come. This is probably one of the most recognisable images of Tory. 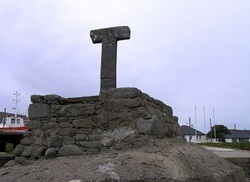 The cross, made of one piece of mica slate, 1.9m/6' 3" high and 1.1m/3' 6" wide, stands beside the pier and dates from the 6th century or perhaps earlier. The cross is of great imporance to the people of the island and many fishermen still pray at it before setting off to sea. The Tau cross on Tory is one of only two in Ireland, the other being at Roughan Hill in County Clare, the cross in Clare has been moved for safe keeping to the Heritage Centre in St. Catherine's Church there and replaced by a replica in the original setting thus making the Tau Cross on Tory the only one in Ireland still in it's original position. The origins of the Tau cross is somewhat confusing with various theories. The first mention of Tau is to be found in the Old Testament in Ezekiel 9:4 'Go through the city of Jerusalem and put a Tau on the foreheads of those who grieve and lament over all the detestable things that are done.' The Tau is the last letter of the Hebrew alphabet and is almost identical to the letter T. The Tau Cross is also used in a symbol of the arm of Jesus crossed over the arm of St. Francis each with hand outstretched and showing the mark of the cruxifiction. 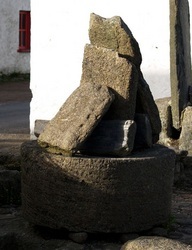 It is also known as St. Anthony's Cross and this of course gives it connections to the Coptic Christians. As we have said, the Tau Cross on tory is made of mica slate which is not found on Tory. Mica was used in ancient Egypt and the Tau Cross shape was used by the Coptic Christians, who came from Egypt. 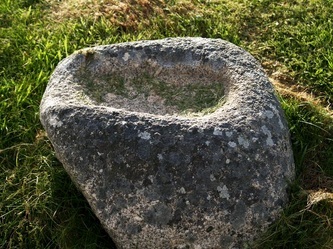 The link here is in connection with Killybegs on mainland Donegal where there is a Holy Well set on a hill just outside the town. 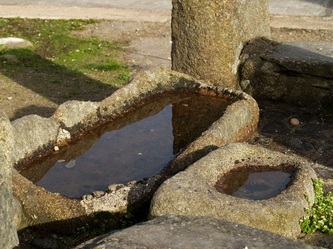 The well is called St. Catherine's Well. The St. Catherine it is named for is St. Catherine of Alexandria (in Egypt). The well was founded by three men (holy men or scholars it is thought) many centuries ago and the story goes that they hit very stormy waters and prayed to reach safe land. They prayed to St. Catherine and promised that if she saved them and they made it to land, they would found a Holy Well in her name. 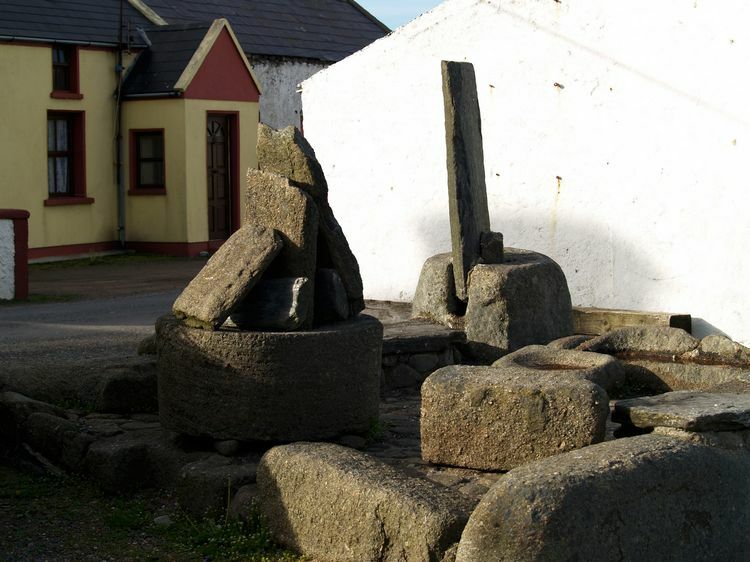 They did land safely, washed up at Killybegs and founded St. Catherine's Well. 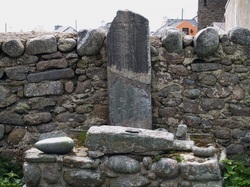 So, we don't know how the Tau Cross got to Tory or where it came from but there are some interesting links between areas of Donegal and Egypt. 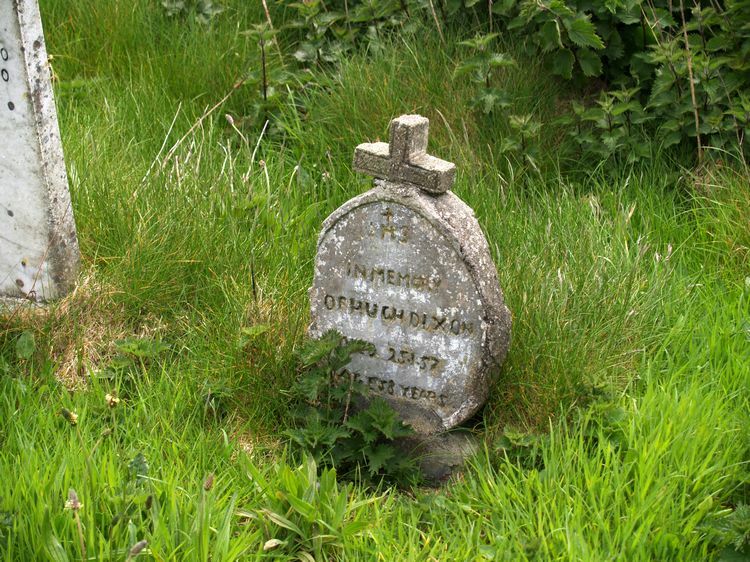 On the Tory Tau Cross there can be seen two deep cuts across the front of it and legend has it that these marks were made by a Cromwellian soldier called Aindreas na gCros and though the cross did not break, the marks made are still visible today. 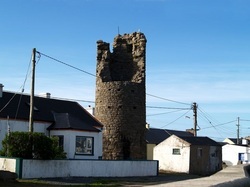 The Round Tower dates from the 6th century and is all that is left of St. Colmcille's monastery (see The Old Graveyard below) that once stood there and would have served as the belfry for the monastery. 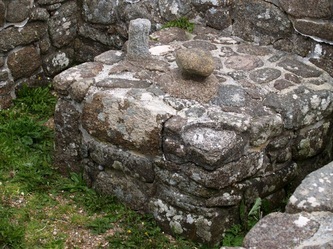 It is made of granite and once had a bell at the top. The top part of the tower suffered extensive damage from a lightning bolt in the late 18th century and the bell fell from it's place. It is not known where the bell is now. The tower stands some 12.8 meters/42 feet high and has a circumference of 15.7m/51' 5" and can be found along the road just left of the pier. It consisted of three storeys, two being underground. 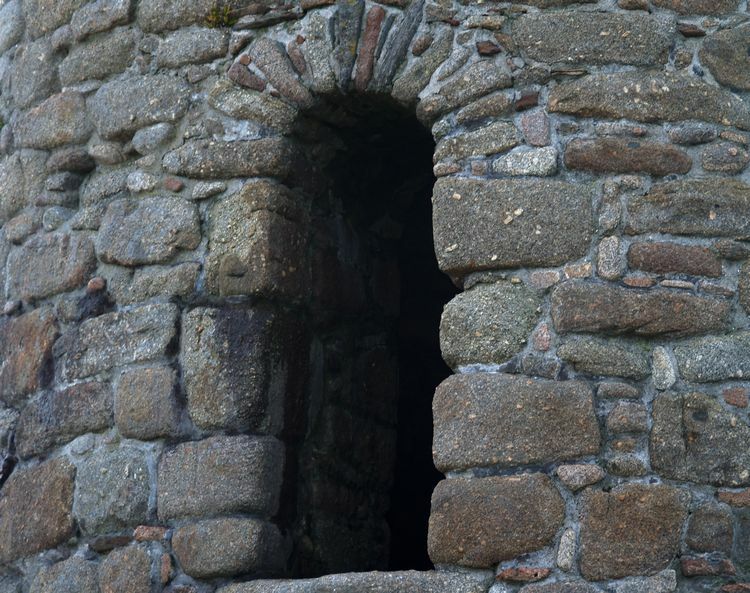 The door to the side is some feet up from ground level, as was the way with such towers, to save those inside from attack when they could pull in the rope or ladder they had used to get to inside. 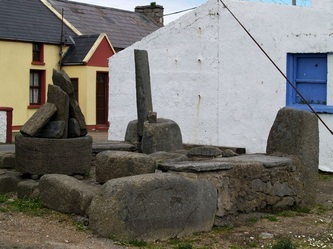 The old graveyard is situated beside the tower and it is thought that it was on these grounds that St. Colmcille's monastery (an Teampall Bui) sat although nothing remains of the building at all. The monastery was destroyed in 1595 by George Bingham, Governor of Connaught under Elizabeth I of England. 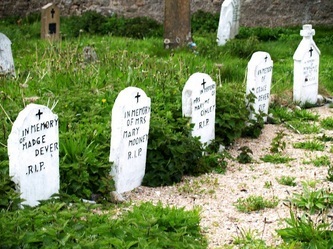 The graveyard is a lovely little graveyard in that a lot of the headstones are handmade, hand engraved and hand painted. 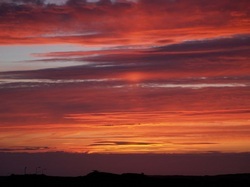 Added to that it enjoys a lovely location looking as it does across the sea to mainland Donegal. 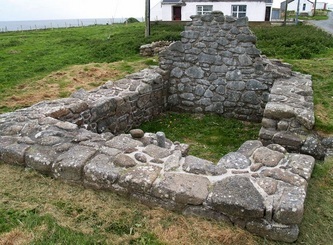 In the graveyard there is too the remains of a stone alter, Oratory of St. Bridget (see below). At the back wall of the old graveyard there is an old stone alter with a few Holy Water fonts on it. 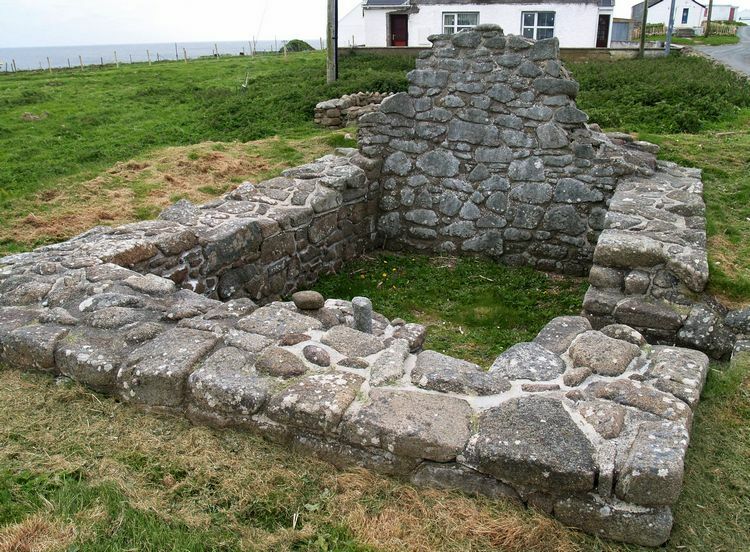 This is all that remains of St. Bridget's Oratory which would have been part of the monastery. At one time there was a stone Chalice here believed to have been used by St. Colmcille during his time on the island. The Chalice can now been seen in the National Musem of Ireland (Collins Barracks), Dublin. 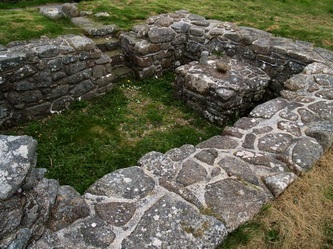 In the photographs of the alter to the left here you can see a little of the Round Tower to the right of the photograph. 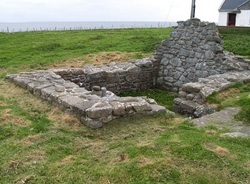 Together with the monastery there was around seven small Oratories on the island (see above for St. Bridget's Oratory). Near the Round Tower there is number of stones, one of which is St. John's Alter. 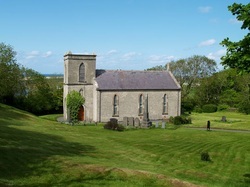 Before St. Colmcille's Church was built (in 1857) it is here the islanders would have attended Mass. The group of stones around St. John's Alter may have been from some of the other Oratories. 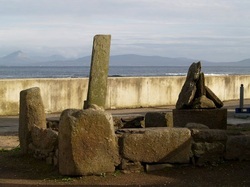 On the west side of the island there is another Oratory, known as the Grave of the Seven. 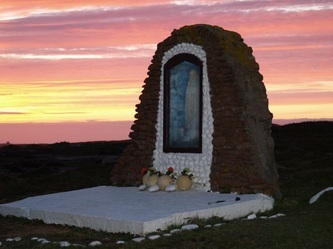 It is to commemorate the seven people (one woman and six men) whose curragh (boat) was washed up on Tory Island with all seven dead. Tory Island lighthouse is situated at the far west end tip of Tory and is one of 11 Donegal Lighthouses. 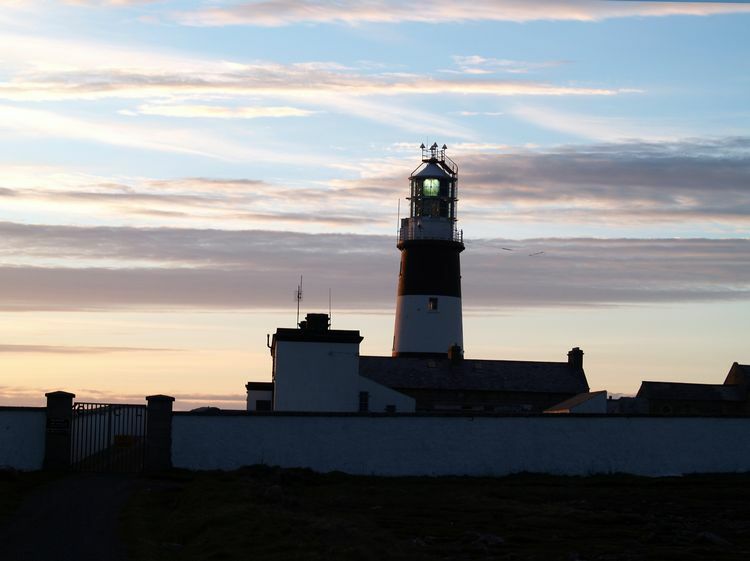 It was designed by George Halpin and building on it was commenced in 1828 and completed in 1832 when the light was established. 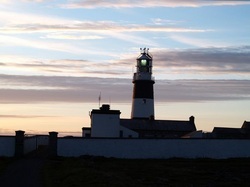 It is one of three lighthouses in Ireland in which a Differential GPS (Global Positioning System) is installed. A point of interest here. The wall around the lighthouse includes stones taken from an ancient dolmen which was once on the island (obviously before people realised the historic value of these ancient burial mounds. The late artist, Sir Derek Hill (1916 ~ 2000), is strongly linked to Tory Island is credited as the person who brought an interest in art and painting to Tory. Although English born, he developed a love of Donegal following his first visit to the county to paint the late Henry McIlhenny of Gleveagh Castle. Later he purchased a house in Churchill just outside Letterkenny. This house, Glebe House, and it's contents and art works he left to the state and it is now open to the public to visit. He spent a lot of time on Tory capturing it's beauty on canvas. It was during one of his early visits in the 1950s that a local fisherman, James (Jimmy) Dixon (1887-1970 ~ there is a photograph of his gravestone above under The Old Graveyard), stopped to see what he was doing. 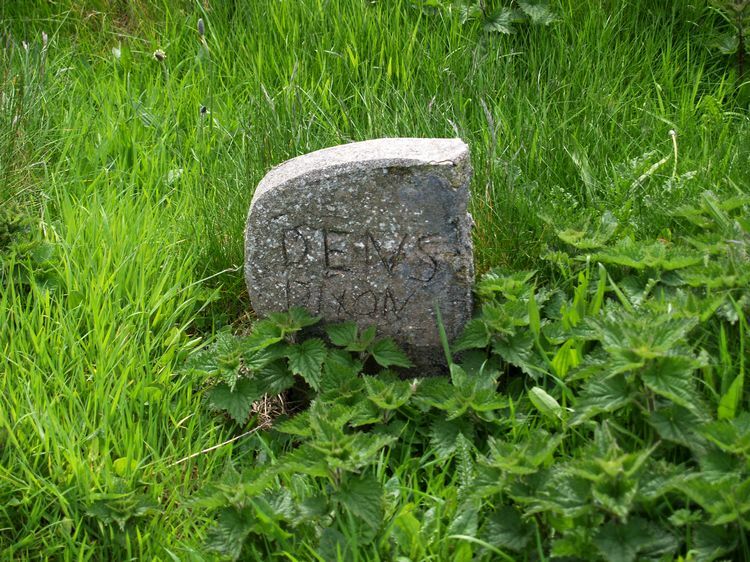 After chatting for a while and Derek picking up an interest from Jimmy who is reported to have said to the artist "I can do that", Derek offered to bring paints, canvases and paint brushes for him the next time he came to the island. Jimmy told him to bring the paints and canvases but not to bother with the brushes saying he would prefer to use his own brushes which he made from the hair of his donkey's tail. Earlier it had been said that this was Jimmy's first interest in painting but it is now known that he had in fact been painting for some time prior to this first meeting with Derek in the late 1950s. Derek Hill later said of Jimmy's choice of brush "This last factor seems important for his work as it helps, I think, to give the painterly quality one finds." That first meeting between the two great painters began the now world renowned school of Tory Primitve (or native) Painting. The photograph in this section shows the little hut that Derek Hill stayed in during his trips to Tory. 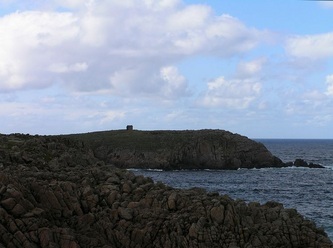 It is on a remote and rocky headland on the north west of the island. 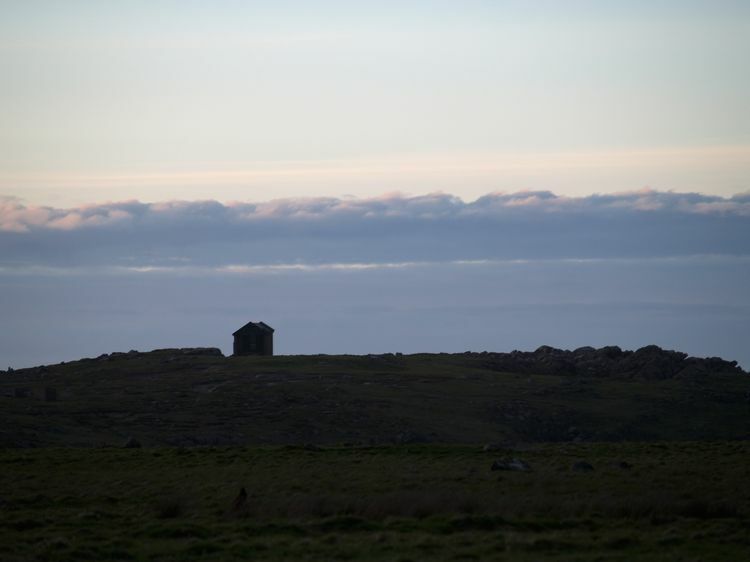 The photographs below taken from various places on the island show just how remote it is. 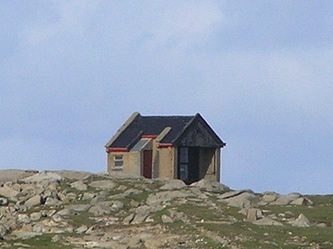 The hut was not owned by Derek Hill but rather given on long term in 1957 let to him by the Commissioners of Irish Lights and he used this hut as his island home for the following four decades. After his death the Commissioners allowed the hut to be let to the Tory School of Primitive Painting. 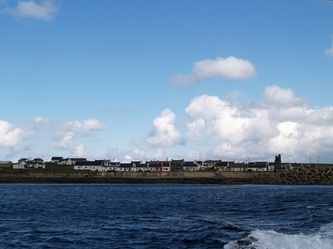 There are numerous ship wrecks lying off Tory Island, which is hardly surprising given that the waters, known as Tory Sound, are amongst the most dangerous to navigate in Ireland. The most famous wreck is that of the HMS Wasp, a gunboat built by Vickers in Barrow-in-Furness in the northwest of England in 1880. She weighed 465 tons and was powered by steam engines but was also rigged as a schooner. The HMS was was travelling from Sligo to Moville to pick up more crew, the intention being to go to Tory to take taxes and rates from the islanders, which taxes and rates they had refused to pay. On the night of the 22nd of September 1884 as the gunboat with her crew of 56 sailed just off the south west tip of Tory she hit rocks. 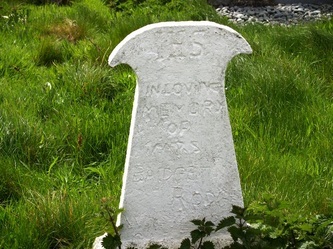 The crew were ordered to launch her lifeboats but these were wrecked by the high waves whilst still on the davitts. The sinking gunboat was pushed further out to sea and when she eventually hit the bottom and only the her masts were visable. 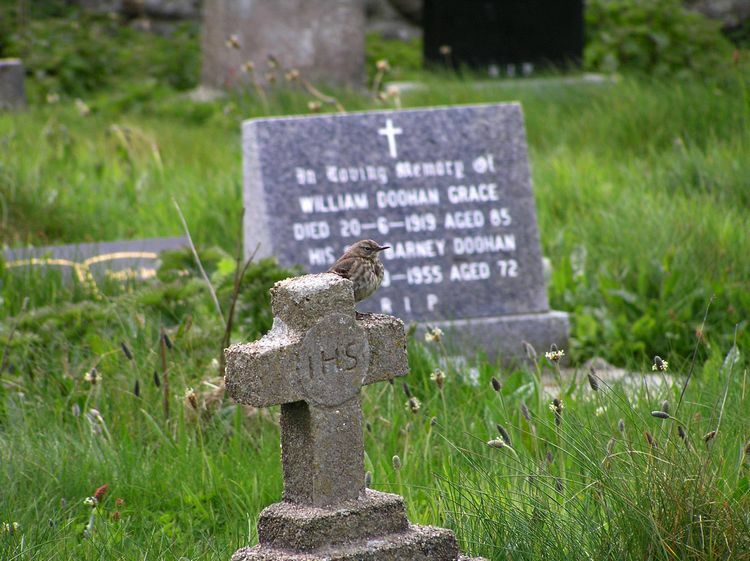 Eventually all but six of the crew were killed with their bodies washed up both in Donegal and as far away as Mayo. 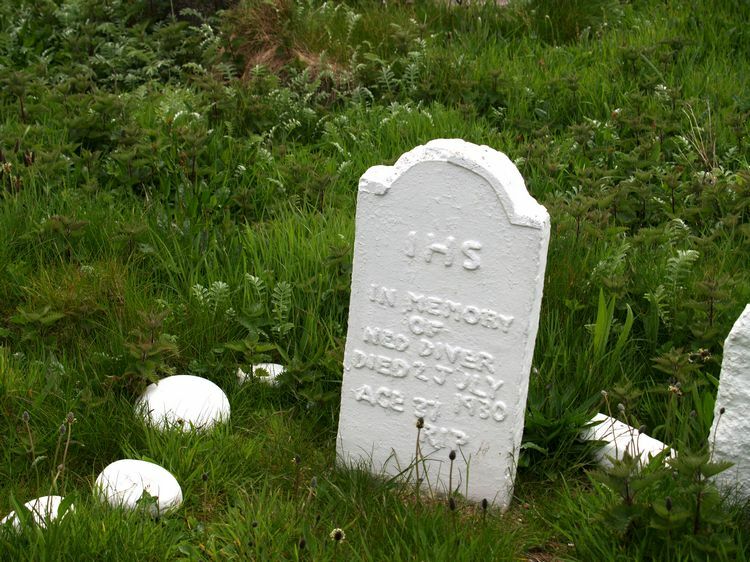 Those washed up on Tory were buried in a plot now called The Foreigners Grave (An Reilig Ghallda) which is near the lighthouse. However rough seas over the years have now probably washed away most of these bodies. 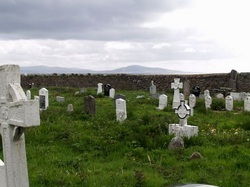 Eight more were buried just outside Falcarragh on the mainland, in St. Ann's Church of Ireland graveyard at Killult (pictured here) which actually enjoys perfect views across the water to Tory Island. The names of those buried there include Thomas Bosworth, Albert Stiles, Fredrick W. Frost and five other whose names are unknown. The six who survived were: R. Rattenbury, Quartermaster; J. Hutton, Ship's Cook; P. Andrews, 2nd Captain of the Forecastle; W. H. Dunne, Seaman; A. Bromhead, Private of the Royal Navy; and W. Styles, Private of the RN. The ships cook, J. Hutton, has gone down in Tory history as a strong man who returned to the stormy seas numerous times in an effort to rescue his fellow crew members. The wreck of the HMS Wasp still likes just off Tory Island at a depth of about 15m/50' and can be dived to in good weather. There are also two cannons lying on the seabed nearby which may or may not have been aboard the HMS Wasp. 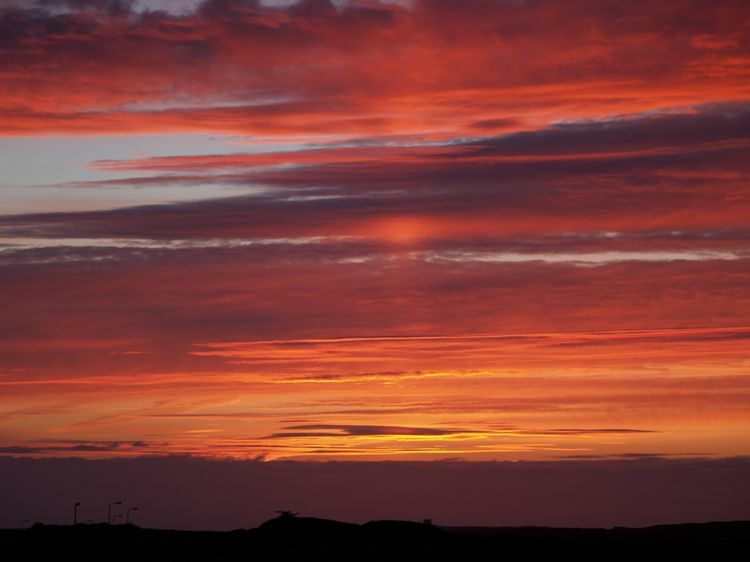 Given the fact that the island is polution free and free too of any tall buildings, the skies at sunset over Tory are quite spectacular. The photograph to the right here is totally untouched and depicts exactly what you can expect to see at sunset on Tory Island. Click on any of the photographs below to see a larger image.